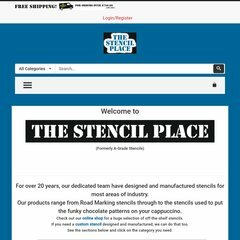 Topics: Stencil Shop, and Road Marking Stencils. 28 users visit the site each day, each viewing 2.40 pages. The site is programmed for PHP/5.2.9. Its 3 nameservers are ns1.web24.net.au, ns2.web24.net.au, and ns3.web24.net.au. It is hosted by Web24 Pty Ltd Virtual And Dedicated Server Colocation Provider Mulgrave (Victoria, Mulgrave,) using Apache web server.